So, the blog continues - my favourite seven nature books of 2012 reviewed over the first seven days of December. If you've missed the first two, you can catch up with them here (day 1; day 2). Each book is presented alongside a 'perfect partner', so please scroll right down the page to read both. If you're looking for a Christmas present, these would be ideal, but please don't forget that you can order a copy of my British Wildlife calendar here. Right, no more plugs, I promise. As before - direct links are given to online bookstores, but please don't forget to support your local, independent bookshop - they need you this Christmas! Earlier this year, I made the bold move of getting down on one knee (yes, folks, I did it properly – no messing about) and asking the love of my life to marry me. What’s more, I chose a waterfall as a suitable place to pop the question. Had I read Brian J. Hudson’s book in advance of making this move, I might have thought my choice of location was a little contrived—it turns out that waterfalls are one of the most popular places for such declarations of love—but I hadn’t, so I didn’t, and so I did it – if you get my drift (there was a joke that surfaced, pardon the pun, soon after that I had threatened to push her in if she’d said no – I hadn’t made any such threat, but thankfully it didn’t come to that anyway). The place was Lodore Falls in England’s stunning Lake District, a waterfall much loved and written about by Lakeland poets Samuel Taylor Coleridge, Robert Southey, both of whom make appearances in Hudson’s book. Waterfalls carry a great number of associations; not least are they an essential part of the cycle of life on earth, but they are memorable, beautiful, awe-inspiring, dangerous, places that lovers are drawn to, as well as being places that are often chosen by people wishing to ‘make their quietus’. In short, waterfalls are the stuff of life, both in practical and in emotional terms. In this book (which is one of Daniel Allen’s Earth Series) Brian J. Hudson, takes on the challenge to provide some sort of chapter-by-chapter narrative that incorporates each of these aspects, discussing waterfalls as geological formations, places of allure, sources of inspiration for artists and writers, models for landscape gardeners, sources of power generation and destinations for tourism. A final chapter discusses the future of threatened waterfalls today and the future facing them. It is a noble task to take on, and Hudson acknowledges early on that as a geographer, the book as taken him into areas outside his specialism, but such a caveat proves to be unnecessary. Each of the chapters is dominated by a great deal of research, woven together by a narrative of clear (and deep) understanding, with a keen interest in all aspects of the study in each area. Not only is there a wide range of impressive research within the text, but the book is lovingly illustrated throughout with at least one picture, often more, on every opening of the book with few exceptions. These include not only photographs of waterfalls from around the world, but also historic paintings, classic film stills, engravings and Chinese ink drawings. This really is a feast of waterfalls for the eyes as well as the mind. Within the first half of the book, we hear from key figures in this discussion of landscape; Edmund Burke, William Gilpin, as well as Wordsworth and Turner. Hudson has many interesting comments to make on bringing this material, not least in the observation that, whilst Milton was writing Paradise Lost, the paradise of his mind was a flat, smooth landscape in which mountains were seen as nature’s deformities. In the age of Romanticism, the new views of Arcadia and Elysium so often expressed by poets begin to romanticise the mountainous landscape in which waterfalls are abundant, and so the emotions begin to surge forward alongside the waters themself. It wasn’t just these figures in the arts who felt this emotional allure around waterfalls, however. In chapter 3, Hudson quotes Charles Darwin’s account of a childhood holiday in Wales, ‘I remember...a waterfall with a degree of pleasure, which must be connected with the pleasure from scenery, though not directly recognised as such.’ The account is certainly more sober than Goethe and Ruskin, and we’re unlikely to aspect anything else from the great naturalist, but the unfathomable, sublime allure is still clearly evident. It is a sense of allure that is discussed by Hudson not only with reference to the representational qualities of waterfalls, but also their appeal to all the human senses (of course, you don’t just see and hear a waterfall, but smell and taste it as the spray rises). Whilst Hudson’s book makes reference to a huge array of waterfalls all over the world, there is a useful bias for the British reader to great waterfalls in Britain. I read the book whilst on the Isle of Mull, and took time out to visit the great Eas Fors on the Western coast of the island which is both pictured and discussed in the book. There are many other falls familiar to me discussed too, not only Lodore falls, but Kinder Downfall in the Peak District, but the book also whetted my appetite for visiting a great number of other waterfalls round Britain that are pictured and described so vividly. Readers elsewhere should not find this slight bias problematic, since the theme of the book is certainly to account for the ideas surrounding waterfalls internationally in all cultures through time. More scientifically-oriented chapters provide brief overviews of the various formations of waterfalls, in addition to the great array of wildlife that can be found around them. In addition to species such as the dipper, a bird that is favourite of photographers at waterfall sites in Britain, an intriguing example Hudson gives is the Australian waterfall frog. This little fella is specially adapted to withstand the torrent without being dislodged, and is able to use hide behind the flow of water if disturbed. It’s impossible in this short review for me to acknowledge all aspects of this wide-ranging book. 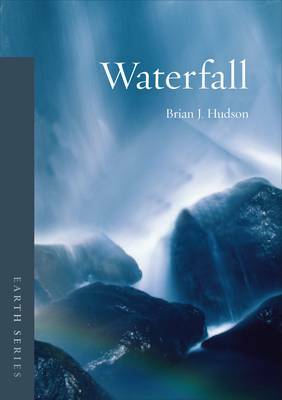 Nevertheless, the most impressive fact remains that Hudson has successfully woven the great variety of information together, often cross-referencing points to provide a book which is not simply a progression of various chapters, but a continuous narrative that deepens the readers’ understanding of waterfalls. The broad scope of this study also lends great appeal to the Earth Series in general, which will grow to feature similar titles on a whole range of features of our natural landscape – it’s a series well worth looking out for. Brian J. Hudson’s book above covered so many areas of thought connected with the natural world that I went back and forth between various choices for a perfect partner. The closest also ran was William Gilpin’s classic Observations on the River Wye of 1770, a central text for the study of the Picturesque depiction of nature which became so popular within the 18th and early 19th centuries, and to which Hudson devotes a chapter in his Waterfall book. This is available in a very slight paper back, like a bookish-person’s stocking filler. Nevertheless, Dinah Birch’s selection of John Ruskin’s writings for Oxford World’s Classics has won over by the narrowest margin. 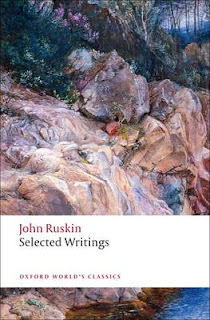 As referred to in my review, Ruskin is another figure who features significantly in Hudson’s book, and this book contains many of the most important texts for the reader to get a good grasp on Ruskin’s ideas on art and nature, among other subjects. It contains the three small essays from the first volume of Modern Painters (1843) on water, space and sky as well as his essays ‘Of the Turnerian Picturesque’ and of Turnerian Topography’ from volume 4 of the same work (1856). Further selections included here are his lecture ‘Sesame and Lilies: Of Queens’ Gardens’ (1865), ‘Prosperina: The Flower’ (1875) and his first lecture from ‘The storm-cloud of the Nineteenth Century (1884). And for nature enthusiasts, central to the book is Ruskin’s celebrated essay ‘Of the Pathetic Fallacy’, in which he challenges the general received notion that objects of nature hold within them emotional significances that may be read by humans (‘we may go on at our ease to examine the point in question,—namely, the difference between the ordinary, proper, and true appearances of things to us; and the extraordinary, or false appearances, when we are under the influence of emotion, or contemplative fancy; false appearances, I say, as being entirely unconnected with any real power or character in the object, and only imputed to it by us.’). This is an interesting area to debate, since not even Ruskin is infallible to the fallacy, as can be noted in the quotation in the review of Hudson’s book above. 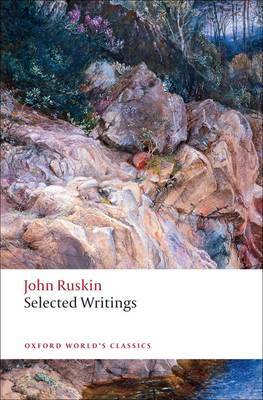 This is a selection which offers a superb introduction to the writings of Ruskin on art, architecture and nature, and will also serve as a good general reference for anyone with an interest in the area of 19th century interpretations of nature.